With morning frost already on the lawns, winter is upon us and most of us have already started using our heaters. Along with the frigid temperatures, the team here at South Nashville Heating and Cooling want to be certain your indoor temperatures are both practical and comfortable. Setting your thermostat to just the right temperature will definitely ensure that your home and family are warm and comfortable all winter long and certainly help with your energy savings. With that said, you may very well ask ‘what is the ideal temperature setting for my thermostat?” The answer is dependent upon your following these very simple but important tips we here at South Nashville Heating and Cooling have to offer all our valued clients. Consistently changing and fluctuating the temperature setting on your thermostat will undoubtedly result in much higher utility bills. Typically, homeowners will rush to turn the thermostat up the moment the outdoor temperatures drop. In your efforts to warm up as quickly as possible by raising the thermostat setting, you increase your energy costs and minimize the efficiency of your HVAC system. When you constantly raise and lower thermostat temperatures you force your system to work much harder for much longer. This ultimately results in excess wear on your system and can reduce the lifespan of your unit over time. In order to save money and enhance the overall functionality of your heating system, the experts here at South Nashville Heating and Cooling highly recommend you set your thermostat between 68 and 72 degrees during the daytime hours. When your day comes to a close and it is time to retire for the evening, setting your thermostat at an appropriate temperature will not only keep you comfortable while you sleep but will add to the energy efficiency of your home. You certainly do not want to set the thermostat too low since this can disrupt your comfortable night of sleep. Rather setting your thermostat at temperatures between 65 and 70 degrees will provide the comfort you require and contribute to those lower energy bills. If you are like so many other homeowners who often times leave the house in the morning without adjusting the thermostat or fall asleep at night without making necessary temperature changes then a programmable thermostat is the ideal solution for you. 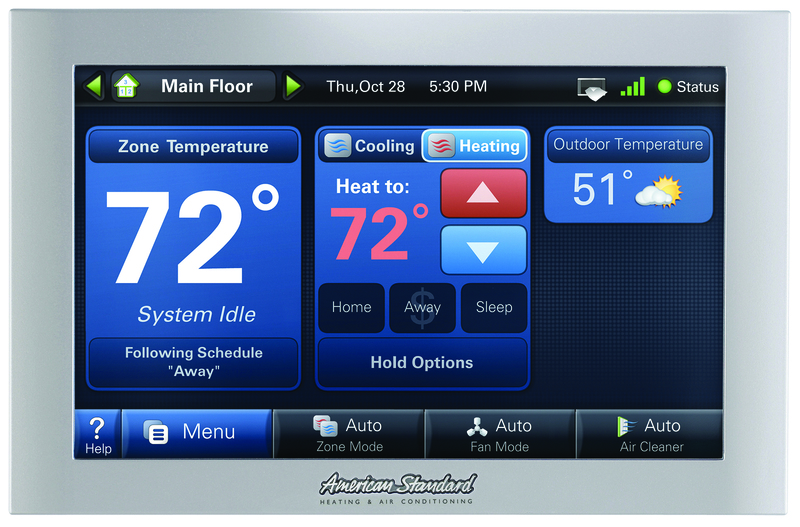 Programmable thermostats are not only an energy efficient addition to your HVAC system, but a great investment for your home. These innovative thermostats help save a good deal of money in the long term while providing you and your family with the ultimate in warmth and comfort. Programmable thermostats afford homeowners the opportunity to schedule specific timeframes for your heating and cooling system to automatically turn on and turn off throughout the day. You can set a specific time for the heat to kick on and again to turn off while you are away without the need for manual adjustments. Truly an effective and efficient tool, a programmable thermostat is a must have for people who are constantly on the go. Simply pre-set your thermostat to turn on at a specific time, perhaps shortly before you return home. Again, you can set a pre-scheduled time for your thermostat to turn off as well. This remarkable tool, not only saves energy and money, but provides you with the peace of mind knowing that your home’s temperature is always comfortable. If you are constantly adjusting your thermostat to provide appropriate comfort in your home, then perhaps it’s time you invest in a state of the art programmable thermostat. We here at South Nashville Heating and Cooling are here to provide you with all your HVAC needs, including the installation of a new, programmable thermostat. Whatever your HVAC needs may be, rest assured we are the team for you. Contact us today and schedule your pre-winter furnace inspection. And if a programmable thermostat is on your wish list this Christmas, then let our expert technicians help you choose the perfect thermostat for your home and family!! Do you Have a Short Cycling Furnace?